Leave a comment on THIS post by 6 p.m. CT Tuesday, July 7, 2015 to be entered in the DRAWING for a Kindle eBook copy of the book below. If you mention in your comment that you’re a follower (see in the left sidebar “Join This Site” and “Follow by Email”), I'll add your name a second time in the drawing. U.S. mailing address required to receive a paper book. Read book giveaway details at Disclaimers. To provide you security, please leave your email address like this: johnATyahooDOTcom. Winner announced in next Thursday's blog post. science, receiving grants from the National Science Foundation and NASA, and being listed in Who’s Who in Computer Science and Two Thousand Notable Americans, James R. Callan turned to his first love—writing. He wrote a monthly column for a national magazine for two years. He has had four non-fiction books published. 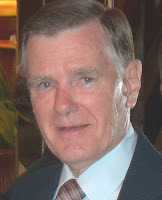 He now concentrates on his favorite genre, mystery/suspense, with his sixth book releasing in 2015. In the article below, “The Story Behind the Story,” James tells about the idea that resulted in his novel, Over My Dead Body. After his article, read about his book and learn where you can find James online and purchase his book. Leave a comment to be included in the drawing for a Kindle eBook copy of the book, which James has offered. The Keystone Pipeline, meant to carry raw petroleum products from Canada to the Gulf coast of Texas has been in the news frequently over the past three years. In fact, it is still a point of conflict between the Congress and the President. It became a point of conflict for me several years ago when a Keystone representative informed us that the pipeline would cross our land. Their plan was to clear-cut a swath of land one hundred and fifty feet wide and about a third of a mile long across our land. 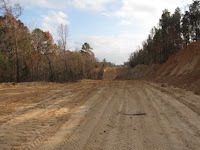 This meant bulldozing down thousands of hundred-foot tall pine trees and fifty year-old oak and hickory trees. We argued, fought, resisted. But, the court had issued an eminent domain order giving the private company the right to do just that. mysteries for the most part. And as I thought about using the Keystone Pipeline as the backdrop for my novel, several points came to mind. First, I was unaware of any murder associated with the many protests citizens made over Keystone. Second, I did not want to bring in a real company where I might face a legal battle over what I included in the book. And third, I wanted the leeway to put in whatever I wanted to, without casting a shadow over real people or companies. To my knowledge, Keystone had done nothing illegal. To me, the problem was in the way eminent domain had been subverted over the years. That was a failing of the courts to protect private property rights. I did not want to imply that Keystone had anything to do with that. So, Over My Dead Body had its genesis from the problem eminent domain had visited on me. But the book would not address my particular interaction with it. The book would be a work of complete fiction. 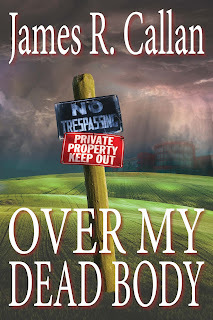 Over My Dead Body released the second week in May, 2015 in both paper and Kindle editions. It has received many very favorable reviews, as did the first book in the Father Frank Mysteries, Cleansed by Fire. 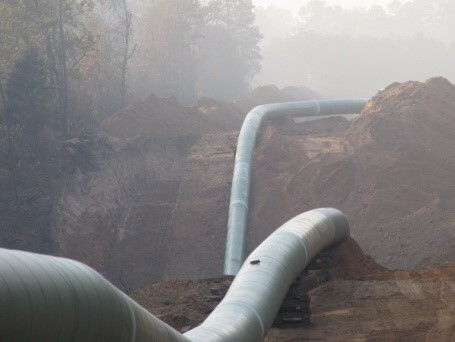 The pipeline has crossed our land. No one was murdered. Except the trees. The loss of the trees was difficult for my wife and me. But, if one looks on the bright side of things, I have gotten a very good book out of it – the silver lining, you might say. And that’s the story behind the story. The winner of last Thursday’s blog post for a Kindle eBook copy of Love's Glory by Darlene Franklin is Nancy G. I’ll email you. Thanks all for commenting. Watch for more book giveaways. 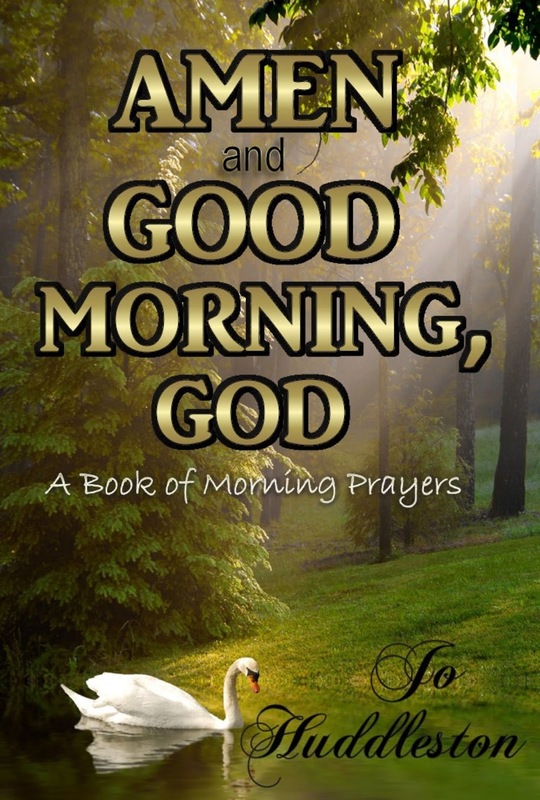 I have a permafree Kindle eBook, Amen and Good Morning, God: A Book of Morning Prayers. It's always free and available at Amazon. Hi Miss Jo! 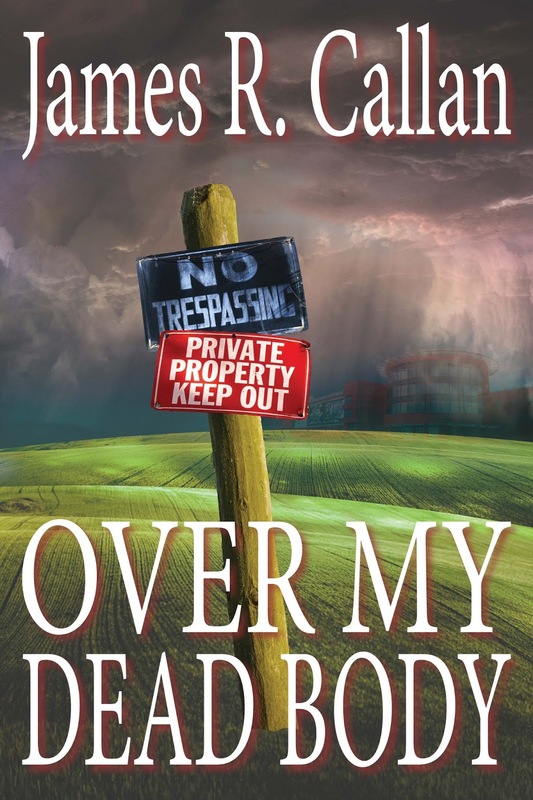 I am very interested in reading James Callan's, Over My Dead Body. It is hard to understand that someone can come in, seize what land they want and destroy trees or homes or whatever to build stadiums or buildings or place pipelines. Thank you for always having a great place to visit and you know I am a follower! Melanie, you're welcome and I agree with you. Thanks for commenting and for following my blog! Thanks for visiting, Melanie. And I'm right with you - can't understand the use of eminent domain for private companies. In this case, it was a foreign company. Oh well. I got a good book out of the experience. Good luck in the drawing. Sounds like a interesting read. I am a follower. I like learning history in a novel setting. Thank You! Karen, you're welcome. Glad you stopped by and I appreciate your following my blog! Thanks for visiting, Karen. I didn't give too much history on eminent domain, but it's gone from taking property for government projects (like highways) to taking land for corporations (when they build this facility, it will help the neighborhood - and our bottom line) to taking private land for a foreign for-profit company. Oops. Sorry. I got carried away. Again, thanks for commenting. Sounds like a great read! Several years ago, my family was involved in a lawsuit with the state over property they condemned and took for a highway, so I know a little bit about how it feels. At least it was the state, and not a Canadian company. But they have my sympathy nonetheless. Thanks for stopping by and commenting, Patricia. BTW, while eminent domain was the genesis, I don't spend too much time on it. I get on with the mystery of who killed Syd. I am very interested in reading "Over My Dead Body". Thanks for the chance to win a copy. Brenda, you're welcome. Thanks for stopping by and leaving your comment. Thanks for stopping by, Brenda. And good luck in the drawing. I love a good "story behind the story"! I sentiment everyone here on the sad fact that they can come in an clear land by eminent domain. Those trees had been there for hundreds of years....very sad indeed! In fact, my husband and I were just talking about this not to long ago. I didn't know there was such a thing as "eminent domain" and still don't see how it can possibly be legal or ethical. Such is politics I guess! Your book sounds good. Thank you for a chance to win a copy! Trixi, thanks for your story. I'm glad you follow my newsletter. Thanks for commenting. Thanks for visiting, Trixi. Eminent domain was originally set up by the government to acquire land to put in highways, etc. You don't want a highway to jig jag around each piece of property where the owner doesn't want to sell. Then it got expanded to allow private corporations to acquire land to put in a project that would bring money into a community (and make a profit for the corporation). Not good. And now, it's for a foreign, for-profit corporation. Really not good. But, the courts have approved it. That's life. That's politics. Good luck in the drawing. WOW, James, sounds like you took a real life situation and turned it into a great novel. I'd love to win a copy! Thanks for the opportunity.